This workshop will introduce the player to more advanced ways of thinking about harmony that moves beyond basic 3 or 4 note chords and their diatonic application. Some familiarity with diatonic chord harmony would be an advantage, but not absolutely essential as the early part of the workshop will deal with this subject. However, the ability to play added 7th chords in at least 1 or 2 fingerboard positions is desirable if the player is to be able to gain the most from this subject as it develops. Areas covered will be basic chord harmony, voice leading, the major/minor/dominant principle, 9th 11th and 13th chords, chord substitutions, the altered dominant chord and the I VI II V progression. Due to the volume of information covered in this workshop it will be run in 2 separate sessions with a little time in-between to be able digest the fundamental aspects before tackling the more advanced issues. Full and complete handouts of all the aspects covered will be provided. 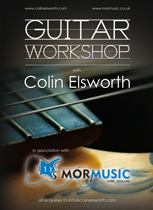 This workshop is aimed at the guitarist that has always wondered how certain players seem to be able to improvise freely with not only solo lines but also full chords, creating numerous substitutions and interwoven melodic lines as they go. They are run in such a way that no-one has to perform on the spot if they don't want to, but each player will have the chance to if they do. The most important thing to try to take away from the 2 hour session is an understanding of the principles involved, so you can then apply them to your own playing at your own pace.